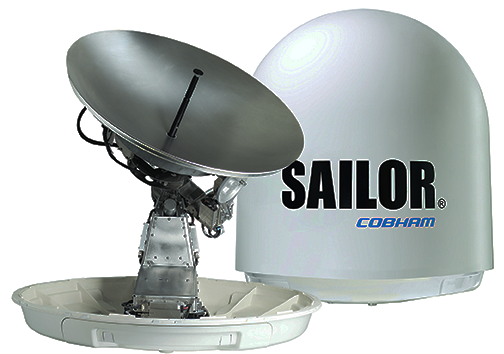 Cobham SATCOM has debuted their new SAILOR 100 GX High Power High Power Fleet Xpress user terminal, building upon the proven success of the firm's market-leading SAILOR 100 GX system. The compact 1 meter, 3-axis stabilized Ka-band user terminal is specifically designed to enable Inmarsat’s newly launched high data rate plans packaged for bandwidth-hungry segments, such as Offshore Support Vessels (OSV), Global Cruise, and Superyachts. Delivering twice the RF power of standard GX terminals, the SAILOR 100 GX High Power dramatically improves the economics of pushing large amounts of data from ship to shore, while also improving overall service quality and availability around the globe. With Inmarsat type approval pending, the SAILOR 100 GX High Power will be on the Cobham SATCOM stand (407) at SMM in Hamburg, the leading international maritime trade fair which runs from September 4-7, 2018. First shipments of the system are expected to follow in October 2018. Jens Ewerling, Director, Maritime Broadband, Cobham SATCOM, said the SAILOR 100 GX High Power system demonstrates the deep commitment the company has for partners and to enabling them to access to new, high value markets through close collaboration. More than that, however, this debut represents the company's focus toward on-going development of the communications foundation that drives digitization and smart shipping. In this context, when it comes to connectivity, every minute matters, and SAILOR 100 GX High Power allows users to maximize their investment in Fleet Xpress. Henrik Møller, Product Line Manager, Cobham SATCOM, reported that, while delivering the highest throughput performance on Fleet Xpress, satellite service providers and fleet operators can rest assured that SAILOR 100 GX High Power is bolstered by software controlled remote access and diagnostics for more streamlined service and troubleshooting,. The company's comprehensive global support network ensures delivery where and when it is needed, with local availability for installation and on board maintenance. This all combines to ensure high operational continuity when selecting Cobham SATCOM hardware to power your digital transformation.